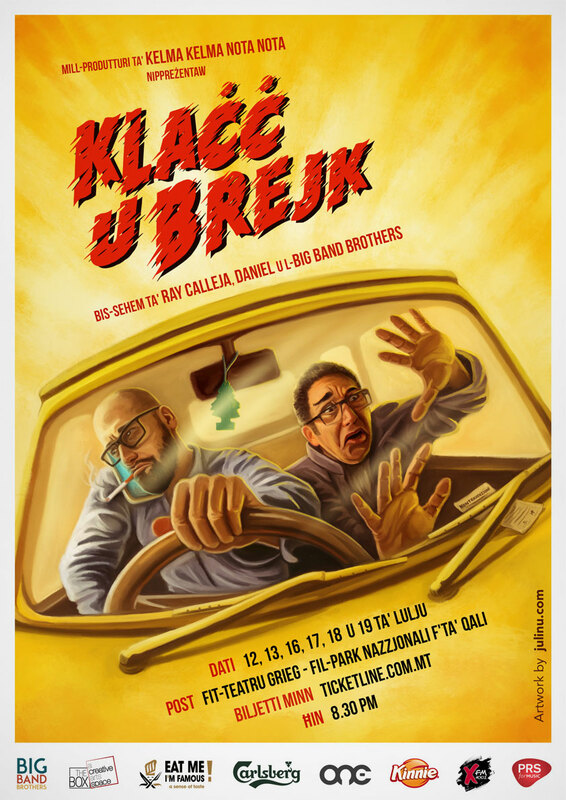 Popular Maltese personalities Ray Calleja and Daniel Cauchi (Big Band Brothers) wished to create a memorable artwork to promote their upcoming satirical show “Klacc u Brejk”. The theme to be tackled was to be the eventful experience of driving on the Maltese roads. I thought it would be fun to go down the route of B-Movie-style artwork and the client agreed with enthusiasm. A photoshoot in my studio helped us determine the poses to be used – in which we wanted to exaggerate some drivers’ typical reckless behaviour. The illustration was digitally hand-drawn using a graphics tablet.